38 pages. Summary: The Philippines is currently one of the fastest growing automotive markets in the ASEAN region. The country is set to become a major automotive player in the ASEAN region in the next ten years supported by rising population, strong economic growth and growing middle income segment of its population. Car production in the Philippines is forecasted to grow at 33.3% annually on average in the next 5 years, the highest growth in the ASEAN region. In 2017, production of vehicles in the country stood at 1.3 million units while sales reached 1.9 million units. 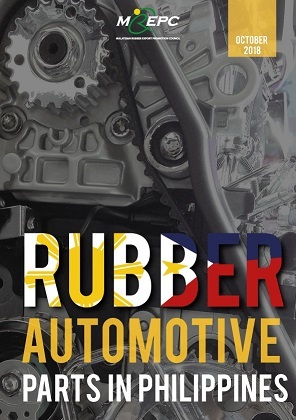 It is projected that demand for rubber automotive parts in the Philippines is set to grow along with the expansion in the local automotive manufacturing industry as well as the growth in vehicle sales. Currently, the replacement market (REM) accounts for 98% of the local demand for rubber automotive parts whilst the original equipment manufacturers account for 2%. MREPC undertook the study on rubber automotive parts in the Philippines to assess the potential for the supply of Malaysian rubber products. This report provides information on the supply chain and key players for the exports of Malaysian rubber automotive parts to the Philippines.